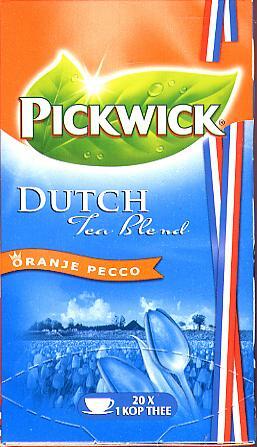 Pickwick Dutch Tea blend -- 20 Tea Bags -- 30g - Tea - Beverages - The Dutch Shop LLC your store for Dutch groceries. Pickwick Dutch Tea blend -- 20 Tea Bags -- 30g. -- 400 years of Dutch tea history forms the basis of this exquisite tea blend. The Orange Pecco tea with some orange zest creates a unique soft and fresh taste.